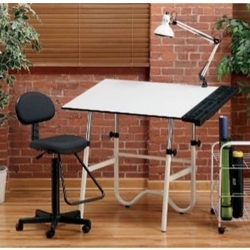 A drafting-height table combination for all your creative needs. Fold-away design for convenient storage. All components packed securely in one UPS-able box. White base with 30" x 42" white Melamine® tabletop. Height adjusts from 29" to 44" in horizontal position. Angle adjusts from 0° to 45°. Pencil ledge included. Black upholstered seat and backrest. Gas cylinder mechanism adjusts height from 23" to 28". Teardrop footrest. Sturdy, multi-compartment, black plastic side tray to hold all your supplies. Installs either left or right side. 31½" long and 6" wide.